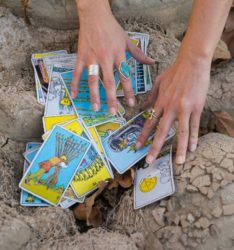 In this workshop series, Mary Grisey will guide you in developing a deeper understanding of the Tarot through the lens of the four Clairs. Whether you would like to read tarot for personal use or for others, this class will help you understand the cards on an intuitive level through Clairvoyance (clear sight), Clairsentience (clear feeling), Clairaudience (clear hearing) and Claircognizance (clear knowing). Four-part workshop series or single classes available. What is intuition? Understanding energy and soul frequency, Clairvoyance, Clairsentience, How to use these two psychic modalities with the Tarot, Hands-on group work, Closing Meditation. Mary Grisey is a clairvoyant tarot reader and visual artist based out of Los Angeles, California. She has been working with the tarot for 15 years and draws from a variety of esoteric systems including astrology, mediumship and clairvoyance to conduct her readings and teachings. She has been connected to the unseen world ever since she can remember and works closely with her Spirit guide, Ruth. During her sessions, Mary channels her client’s ancestors, spirit guides and loved ones. Her psychic approach is heart-centered, therapeutic and always in the highest good of the client. Her fine art background provides a unique approach to her readings and teachings as they tend to foster creativity, inventiveness and imagination.